ELFYN Evans celebrated the best drive of his FIA World Rally Championship career to take a surprise and commanding lead after a brutal Friday’s competition at YPF Rally Argentina. Rock-strewn gravel roads wrecked the hopes of many frontrunners, but Welshman Evans prospered to win six consecutive stages in his Ford Fiesta and lead the similar car of privateer Mads Østberg by 55.7sec. 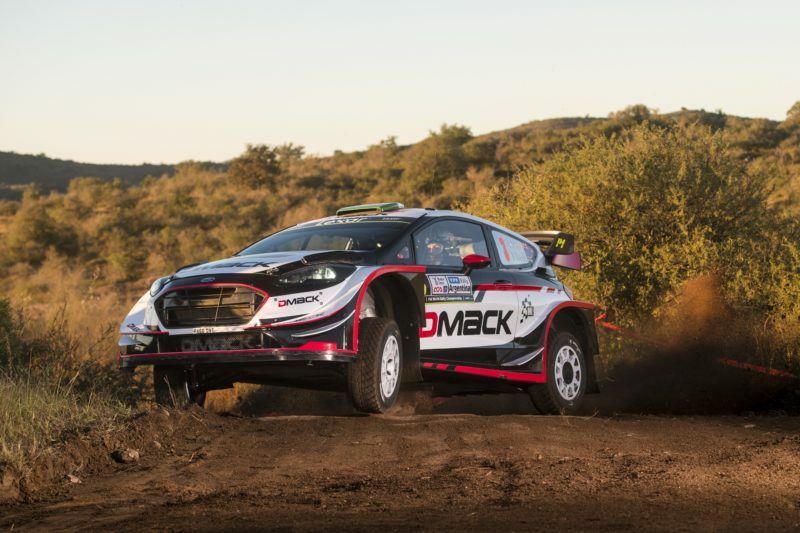 FIA World Rally Championship leader Sébastien Ogier’s slender lead after Thursday night’s curtain-raising street test in Cordoba was wiped out by Evans once the rally hit gravel roads in the Calamuchita Valley on Friday morning. He won all four morning special stages to lead Toyota’s Jari-Matti Latvala by 30sec at mid-leg service. Two more wins, one shared with Hyundai driver Hayden Paddon, stretched his advantage as Norwegian Østberg came through to grab second on his return after a two-round absence. “It was pretty tough at times but we can be happy with today,” Evans said. Østberg’s patient strategy paid dividends. Like Evans, a low starting position offered cleaner and faster roads on the morning loop and he avoided the rocks to climb the order, despite brake problems which induced a couple of small mistakes. A fierce, four-car fight for the final podium finally went to Thierry Neuville. A broken front damper and a puncture delayed the Belgian, who struggled further when dust found its way into his holed Hyundai i20 Coupe and into his eyes. He was 5.0sec behind Østberg. Road-opener Ogier struggled in the dry conditions. He slid into a ditch this morning and later bent his Ford Fiesta’s steering after landing on a rock after a crest. He was 6.0sec behind Neuville and 4.6sec ahead of teammate Ott Tänak, who punctured in the penultimate test. Despite his Toyota Yaris bottoming-out on the rough tracks, Latvala held second until the engine overheated and dropped him a place. A penultimate stage puncture cost a further 30sec and the Finn plunged to sixth. Paddon rolled his i20 in the opening stage but was rejuvenated after lunchtime repairs to share a stage win with Evans and win another outright as he charged back to seventh. Lorenzo Bertelli was eighth in a Fiesta, ahead of Juho Hänninen, whose Yaris lacked power all morning. WRC 2 leader Pontus Tidemand completed the leaderboard. It was a black Friday for Citroën C3 drivers Kris Meeke and Craig Breen. 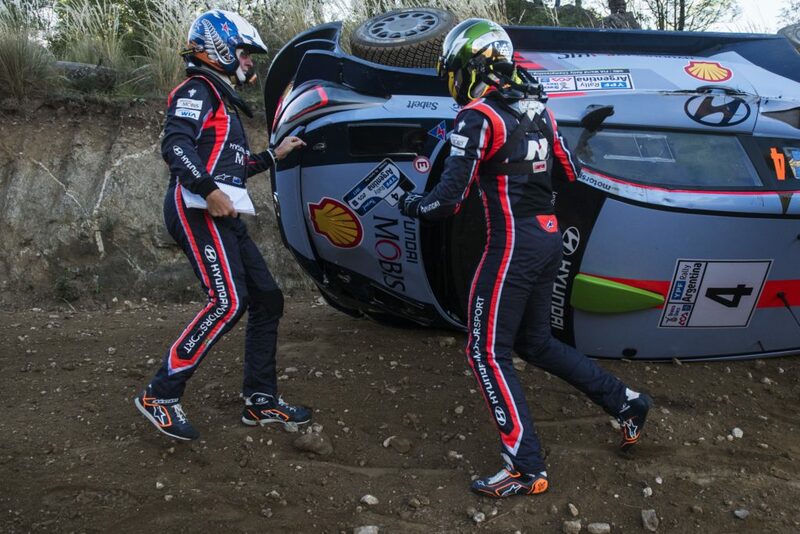 Meeke was second until caught out by a bump which launched his car into the scenery. It was heavily damaged and he retired. Breen’s C3 jammed in fifth gear and he too was sidelined. Dani Sordo plunged down the order from third after hitting a rock and breaking his i20’s steering arm. Competitors journey north-west of the rally base of Villa Carlos Paz on Saturday for the longest leg of the event amid stunning pampas scenery. They face two identical loops of three stages covering 160km.